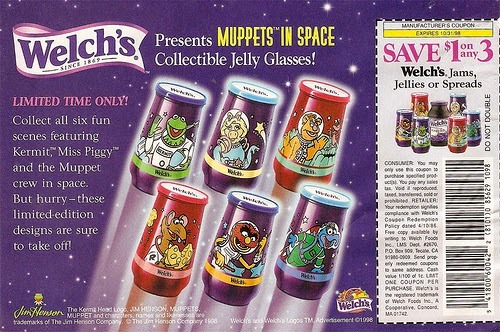 Welch's jelly glasses. Every household had one (at least). 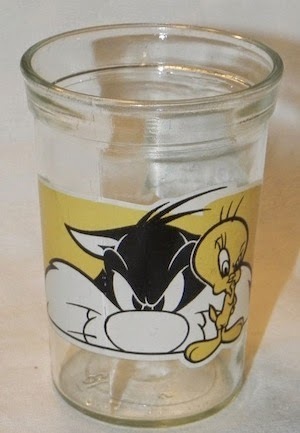 As a child, I always loved them - at one point landing myself a Sylvester & Tweety glass from their 1994 Looney Tunes series. As much as I love grape jelly, it wasn't about that. I mean, it was, in the fact that you couldn't eat the jelly fast enough, but then you got to have this sweet looking glass to use for years to come. 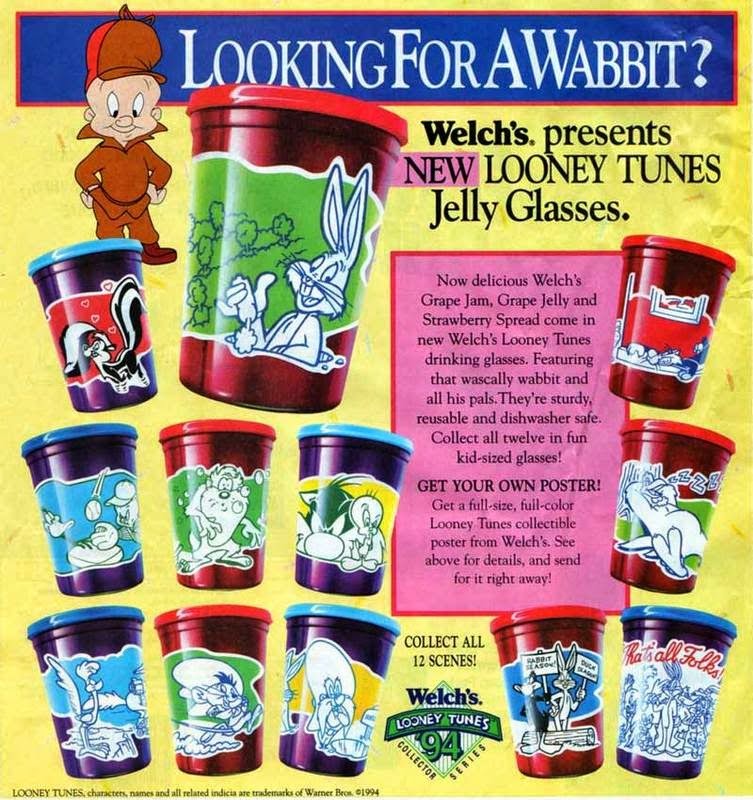 They were on par with those Pepsi Looney Tunes glasses (I'm convinced everyone had those too). Nothing could touch my love for Sylvester. NOTHING. I remember going across the street to my cousin's house and they had a cupboard full of them. I always made it a point to drink out of one - I remember the T-Rex one most. They were a great novelty, like getting the prize in the cereal box, but unlike some of those throwaway prizes, the glass served a purpose afterwards. There isn't a vast amount of information online regarding these, in fact the only evidence I found of Welch's acknowledging they ever existed, is on their FAQ page. People are selling them on ebay, amazon or etsy for anywhere between .99 and $24 for a single glass jar - most without, but some with their lids included. Not bad for a taste of nostalgia. From what I could gather, these glasses began production in 1953 with a set of six Howdy Doody themed jars. The last one I was able to track down is a 2003 set of Dragon Tales jars. Over the years, there were over 25 different sets, with some of the more notable sets being The Flintstones (1964), the aforementioned Looney Tunes (1994), Muppets in Space (1998), Pokemon (2000) and The Peanuts (2001). From the looks of it, they don't seem like a bad investment - most of them holding up pretty well over time. It kind of saddens me that these don't seem to be in production any more. I can't say that I've actively been seeking them out all these years, but I happened to come across them on ebay and it peaked my interest and childhood excitement once again.